I have never been one of those gardeners who plants something and it automatically thrives. Truth be told, I have had more plants die than have lived. I usually try something twice and if I can’t get it to grow, I give up. Not the case with hydrangeas. I have tried over and over again to have big bushes with big, beautiful blooms. I have seen a bit of success with one lone Annabelle but my real success story has been growing limelight hydrangeas. 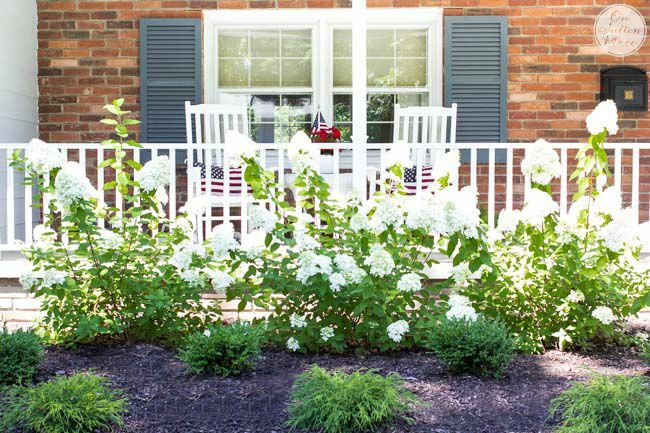 I was trying to achieve an old-fashioned, farmhouse feel when I planted these hydrangeas in front of the porch railing last spring. I honestly thought it would take several years to grow them tall enough to hide the foundation and part of the railing. As you can see in the picture below, they grew much faster than expected. When I planted them I had no expectations. I honestly didn’t think they would make it. I have learned the hard way to not get my hopes up! Anyway, last year (their first) they bloomed beautifully. Not huge blooms but big enough for me to have confidence that just maybe, finally, I would have real hydrangeas with legit blooms. Well…legit they are. The three bushes have bloomed abundantly and I couldn’t be happier. 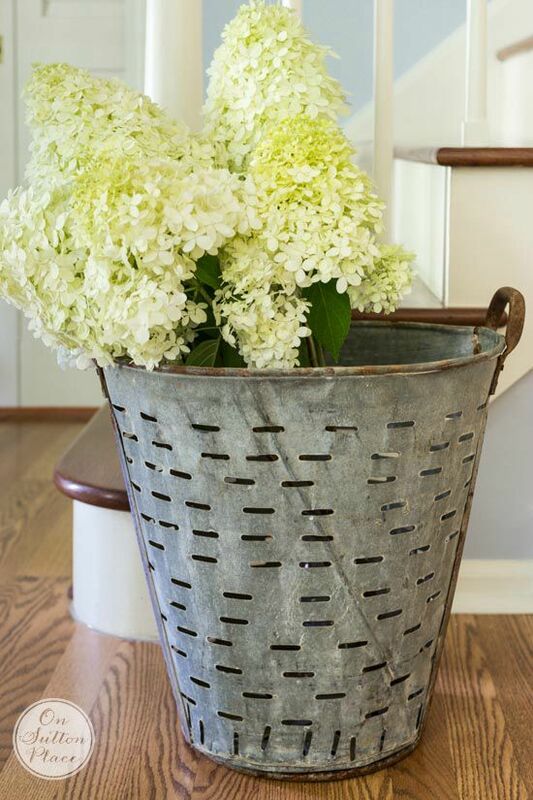 So…if you have always wanted hydrangeas but didn’t think you could do it, try a limelight. Of course I can’t promise anything but they have been pretty easy to grow. 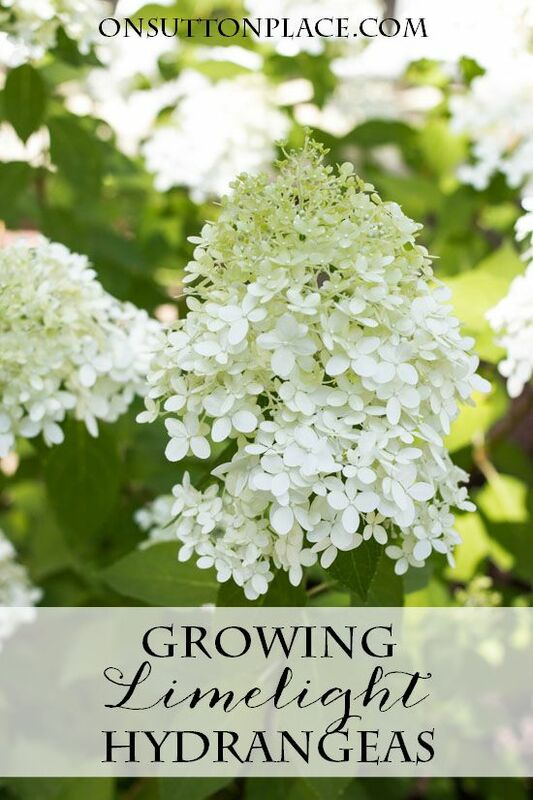 Take into consideration their rapid growth when spacing them in your landscaping. Give them a little more room than you think they need. When pruning or cutting blooms, cut as close to the root as possible. Where you cut each branch, two or three branches form. This means if you cut all your blooms from the top, the next year your bush will be very top-heavy. With blooms as big as these that would be tragic! Remember that they don’t bloom until mid to late July in most growing zones. Do not prune them in the late spring or early summer because you will be cutting off the buds. If possible, wait until the blooms have started to dry and change color before cutting. Believe me I know that will be hard…if you have a ton of blooms you could cut some early and it won’t make a difference. Just don’t cut all of them. In late fall, shape your bushes and prune if needed. Limelights bloom on new wood so you can trim them a bit even in the early spring but fall is recommended. Click the images below for more on limelights. 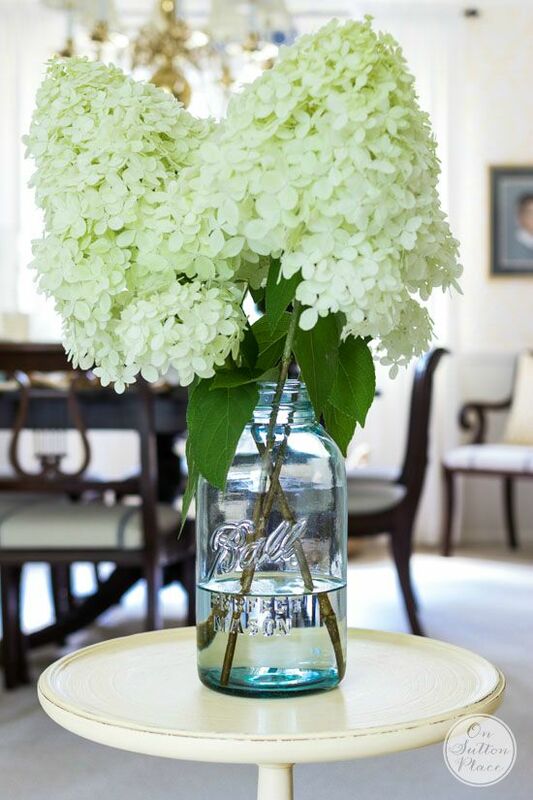 I adore limelight hydrangeas. I have them on my wish list for next year. We just can’t put any more money into our backyard this year. Thanks for the tips. I’m bookmarking this page! I’m up north and we also have Little Lime. It faces north but has sufficient sun in the morning. We haven’t watered it at all but it’s done well through our wetter early summer and then a couple of dry weeks. It’s now happily blooming. Can’t complain at all, considering it was covered with 3 ft of snow for a lot of the winter. My daughter has the Little Limes and loves them! I haven’t watered much of anything all summer due to all the rain we have had. Sort of nice actually! I’m actually growing the dwarf version this year for the first time. Its called “Little Lime”. So far it has been fairly easy to grow and it actually bloomed. I water it daily and so far so good. I missed a week when I was on vacation and it held up nicely….only dropped a few leaves but since then more leaves have grown back and new blooms emerged. So I think the trick is lots of water. Ann your gardening green thumb always inspires me. I just wish it would get in my blood! Beautiful limelights. Last year I took the beautiful dried blooms and buried them in my Christmas tree. The buttery tones of the blush and sage colors of the blooms looked amazing in this tree that has nothing but copper balls and crystal ornaments. I would like to save more blooms this year for Christmas decorating. Thank you for the suggestion! I’m wondering if these will grow in the Phoenix area as we have pretty hot summers? I do not know what our zone is. I looked up Phoenix and it is in growing zone 9 which is pretty hot and dry…as you know. I’m not sure they would make it honestly. They would take a ton of water for sure…all year long. Thanks Ann, especially for the pruning tips. I just started growing limelights last year—I bought three year old plants so they are quite big. Any tips on fertilizing? Hi Jane! I have not ever fertilized mine but they are only on the second year. When they get a bit older they may need something. I usually use Miracle Gro or Osmocote. I love your photography and styling. Do you do it yourself? These flowers are just lovely. I like them better than the ubiquitous pink and blue varieties. Hi Carole! Thank you for the compliment and yes I do all my own photography. It’s not something that has come naturally but I’m getting a bit better all the time. A good editing program helps too! I WILL TRY TO GROW THESE THEY ARE SO PRETTY. QUESTION: what do you know about the “pinky winky” hydrangeas. Both my shrubs leaves turned black and the blossoms died. I’m sorry I don’t know anything about pinky winky hydrangeas…good luck! Your limelights are beautiful, I have got to get a couple of those. 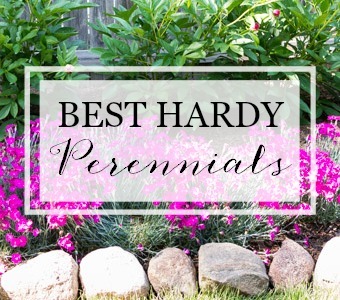 I have several different kinds and for some reason they do really well, I certainly don’t do anything to help them, and we have the worst soil I have ever seen. They grow no matter how much I neglect them. In my perennial beds, I have amended the soil so much and I baby those flowers and do everything by the book and some just barely survive, go figure! I’m so glad your limelights are doing so well and they look good and healthy and those blooms are just so darn gorgeous. Isn’t it the funniest thing how some plants grow and others don’t? Go figure! About 5 years ago we put all vinyl decking including rails and poles So easy to maintain my husband just lightly power washes our deck just once a year and all done. It’s expensive but worth it. 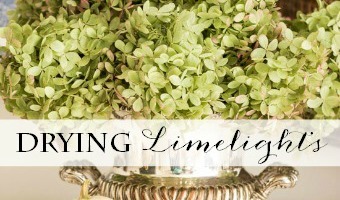 Your limelight hydrangeas are gorgeous. Mine have exploded with blooms (here in Virginia)! Thanks for the info on cutting. 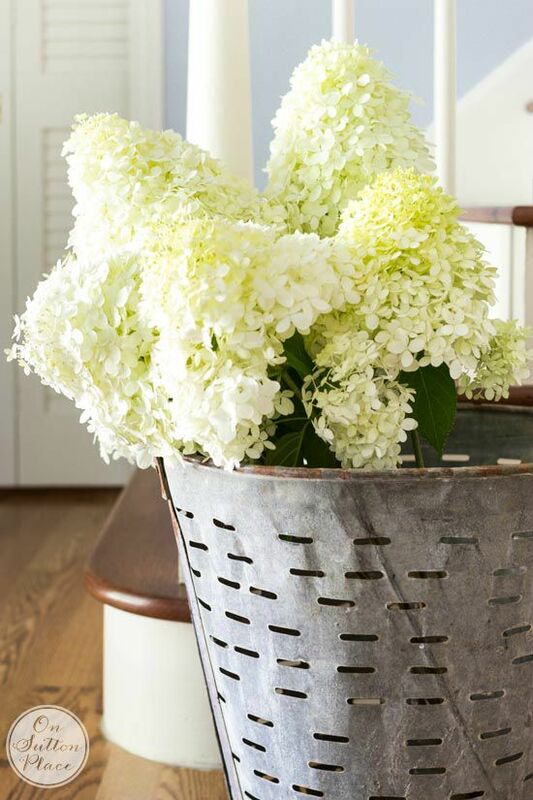 Limelight hydrangeas are my favorites, for so many of the reasons you’ve mentioned. They do get HUGE though (easily 8 feet tall or more) so it’s worth considering ‘Little Lime’ if you want something more in the 5-foot range. 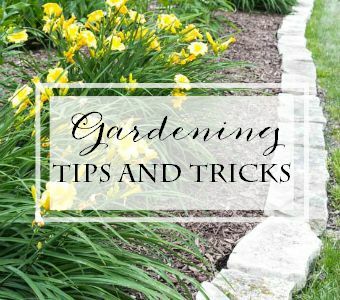 You can contain the size a bit with pruning, but you’ll have smaller flowers when you prune heavily. If you’re going to prune in fall, make sure it’s LATE, LATE fall because if they put on new growth (as plants are wont to do when pruned), it will never harden off and make it through winter (at least if you’re in a place where winters are an issue). I prune in very early March here. Yours are absolutely lovely and I think they are perfect in front of your house. And you just can’t beat that chartreuse color! Thank you Erin! This is great information. I will keep that in mind about pruning in late fall. My leaves are usually falling until Thanksgiving so I could prune when they are all down. I’ll have to make a note of that or I’ll forget! I have Annebelle hydrangeas that were a Mothers Day present when we moved into our new home 22 years ago. I’ve cut them back in the fall or early spring ( depending on if I get my fall clean up done before the snowflakes fly) and always have huge dinner plate size blooms. They are almost indestructible! They are planted by our front porch also. I’ve divided them a few times and shared them with neighbors. I dry some for decorations, usually for my hall Christmas tree. They are my favorite flower! Oh I am jealous. Your Annabelles sound lovely! Some i can grow and some i can’t,but these do look lovely so i will try. Thanks for the advice. Ann I have regular hydrangeas and I did not get one bloom last year. My son’s girlfriend (and hopefully my future daughter-in-law) told me to plant metal things around the bush. I have the most beautiful blooms this year. I can’t believe how well that worked. Don’t know if it works on lime lights but I don’t think it could hurt. That’s a tip I have never heard! By metal things what do you mean? Ann I had some old hinges – no paint and I put them in the ground. I can’t believe how beautiful the hydrangea are this year. Don’t know if the hinges helped but I know they didn’t hurt. Good luck! Oh my gosh this is amazing. Who would have thought? I am definitely trying this! My son’s girlfriend (please God my future daughter-in-law) is a Social Worker but also works at a florist shop around the Holidays. She said the florist told her about it. I just love this girl, so does my husband and thankfully my son. Please let me know how it works. Good luck! Thanks, Ann! I have a couple of the Endless Summer and the Strawberry Shortcake and I love them! Now, I think I’ll get some of these. Whenever I see them around town I think how beautiful they are. It’s nice to know they’re easy to grow! Very nice, Ann. I love this and wish I could grow them. I have two in my front yard. One died last year and the other just does not grow! I wish I knew the secret because they are so nice. I’m sorry Julie…if there was a secret I surely would tell you! Hydrangeas are just puzzling sometimes. Your hydrangeas are lovely Ann! I saw your post on facebook as well this morning. The hydrangeas in my yard are among my favorites but I don’t have any of the limelight variety. 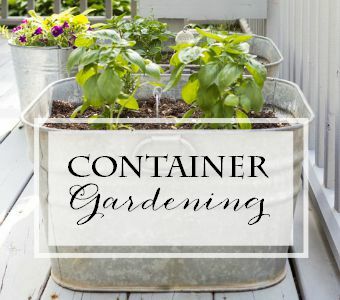 Afterr reading your post, I think I will need to add this type to my garden as well. I recently shared some photos of my hydrangeas on my blog because I was amazed at the variety of colors my shrubs were producing this year. I have read that you can change or alter the colors of your blooms by adjusting the pH of the soil with most varieties, but not with the plants that have naturally white blooms. I haven’t tried this technique yet as I have been pleased with the colors my plants have had. Thanks so much for sharing a glimpse of how pretty your flowers are this year. Hi Dorene! I’ve never tried to change the color of mine either. The honest truth is that I would take any blooms I could get no matter what the color! Your garden sounds lovely. Lovely! I’m definitely going to try them! Your persistence has paid off! Love the Limelight Hydrangeas, I have a shaded area in front of my house and wonder at the of growing these beauties in this location? My experience has been that Limelight wants at least part sun and preferably full sun, so a different hydrangea might be better in a shaded locale. As Erin said I do think they need a bit of sun…not all day but part of the day. Thanks so much Ann – Awesome info and pictures! I’ve saved all of it and someday soon the front of my porch will be beautiful too. Ann they’re beautiful, mine didn’t make it through our rough winter. I have a cousin that’s a master gardener and he says there are brands specifically made for our cold temps, maybe what you planted is one of them. Good for you for getting such gorgeous blooms. Well if I planted that variety it was by accident because I had no idea! I just hope they continue to thrive and it’s not beginner’s luck. lol. 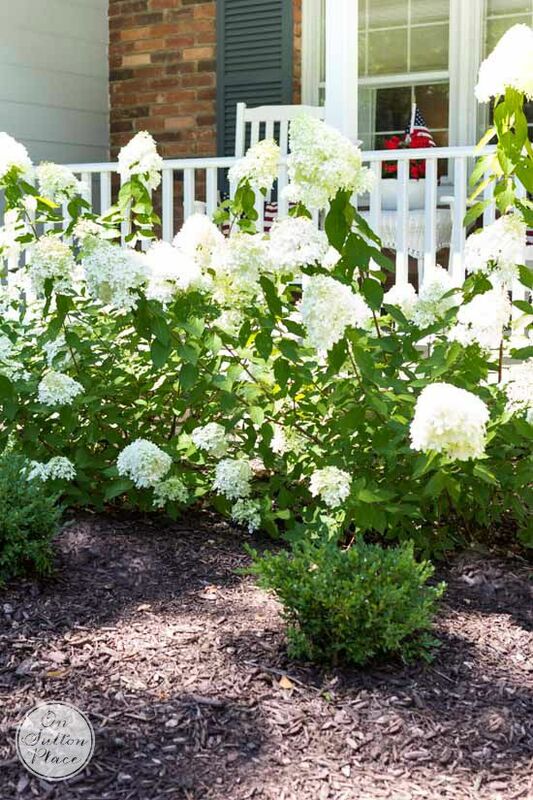 I have been considering limelight hydrangeas for my front yard (near Boston) as a foundation planting on either side of my porch. The only problem is that our yard faces north and there is quite a bit of shade during the day. Do you know how well they tolerate shade? I’ve also heard that the acidity of the soil may affect hydrangeas. How does one test for that and amend the soil? Hi Jani! They do need a bit of sun to bloom. Mine get the morning sun until around noon or 1 pm. As far as testing the soil, I have never done that so I am no help. Good luck! 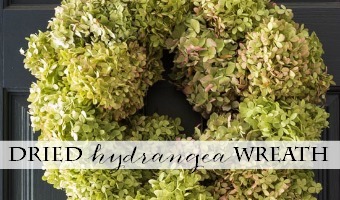 and for anyone who wants a smaller version of the same hydranges there are “little limes”. same look, but smaller. They are gorgeous Ann!….Saw on FB too…I have 2 large areas in my yard with hydrangea bushes. They were abundant with blooms for years…but the last two years they have not bloomed…a mystery….I am going to plant more and see how they do. Thanks for the tips! Love the pics. I have Annabelle hydrangeas along one side of my garage. Now I know why they got top heavy – I always cut my blooms mid way down so the foliage is left behind. I wonder if I can remedy this? When it rains do you find yours topple? That is another problem I have always had even early on before I started to clip some of the blooms. I love drying them. Hi June! I have found that the longer I leave the blooms on the bushes the floppier they get. Some of my branches are practically laying on the ground. I am going to cut some blooms very soon so I hope that helps perk them up a bit. Well, I made your chocolate , lemon and strawberry desserts. I have made your bunny pillow. And downloaded your flower designs and framed them. Keep up the good work and I look forward your e-mails. Oh Linda this is wonderful. I know I am late answering this comment but it honestly just made my day. Thank you so much! Ann, my limelight is so big and abundantly full this year. I was beginning to think some of the branches were going to break. I make arrangements around my house with dried blooms and I have so many I give some away. They dry beautifully! Yours are lovely at your porch! I’m just about ready to cut more blooms Jeanette and I can hardly wait to have pitchers and jars of hydrangeas everywhere! How much sun do you have for the Limelight’s? I would like to plant on the south side of my house but several trees make it pretty shady and I am afraid they won’t bloom. Hi Kristin! I am late answering this comment but wanted to tell you that I think they need about half a day of sun. Mine get morning sun until about noon or 1 pm. We have seven different varietals of hydrangea in our garden, but the only two that flowered this year were the oakleaf and the “volunteers.” The rest were burned in the late freeze in April. Yours are lovely!